Prime Minister Narendra Modi has stressed the importance of integrating the strengths of society with the systems. Speaking at a function organised by NITI Ayog in New Delhi on 17th August, Mr Modi said, processes and systems will have to be changed with the changing times. The Prime Minister stated that the Padma Awards given this year include exemplary success stories of people who have been working silently and tirelessly on the ground. He said government believes every citizen has something to contribute to the nation and Centre wants to integrate these strengths with nation's growth. 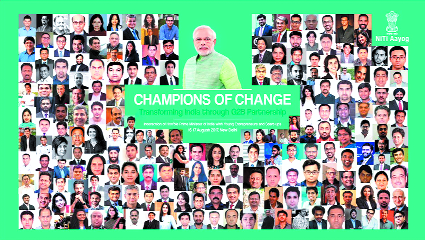 Mr Modi said, policy makers in government and the youth should together work for India's good. He said senior government officials are seeing opportunities in the ideas shared in this meeting. The Prime Minister said, it is unfortunate that corruption was institutionalized and the time has come to change it. He said his government's policies have driven middlemen out of work and they are the ones who are most unhappy. Citing the example of big placements in leading business schools, Mr Modi asked why teachers cannot be recruited with good pay packages in the same way. He said an atmosphere needs to be created where country's youth want to be teachers and educate others. He said a change can be brought about in the quality of education through the use of technology. The Prime Minister however said only government and government initiatives will not make a New India and the change will have to be powered by each and every citizen. He asked the CEOs present to sit with their teams and discuss what can be done for a New India in the next five years. Mr Modi said, innovation is life and without innovation, there is stagnation. He said, technology and innovation should be harnessed to transform governance. The Prime Minister interacted with country's young entrepreneurs and startups across sectors on making a New India. He listened to insightful presentations by young CEOs on a wide range of subjects. The interaction with over 200 Start Up entrepreneurs focused on building New India by 2022, Digital India, health, education and skill development.